Perfect for traffic control in residential areas, the J200 HA bollard is easy to transport, store and install. This retractable automatic bollard features a powder coated finish and fast, silent movement. 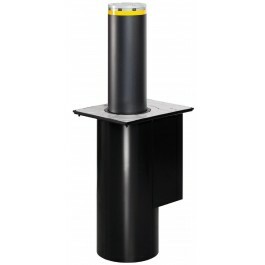 The J200 HA 600 is a hydraulically automatic retractable access control bollard. Designed and manufactured by FAAC, this bollard is built for the control of traffic in residential areas. For convenience, this bollard is automatically retractable and is operable by authorized personnel or through automatic commands. This model is designed for situations where a fixed bollard is not practical. The J200 model is made from sturdy S235JRG2 EN 10277 grade steel and treated with a cataphoresis coating and dark gray metallised RAL 7021 polyester powder paint. The J200 HA is most efficient when used in tandem with the J200 F series and J200 SA series bollards. By incorporating fixed units with the J200 HA, traffic controlled areas keep their uniform aesthetics in areas where the functionality of the retractable models is not practical. The J200 SA is a convenient alternative to the J200 HA as it does not require an electrical connection and is also retractable via key operation.